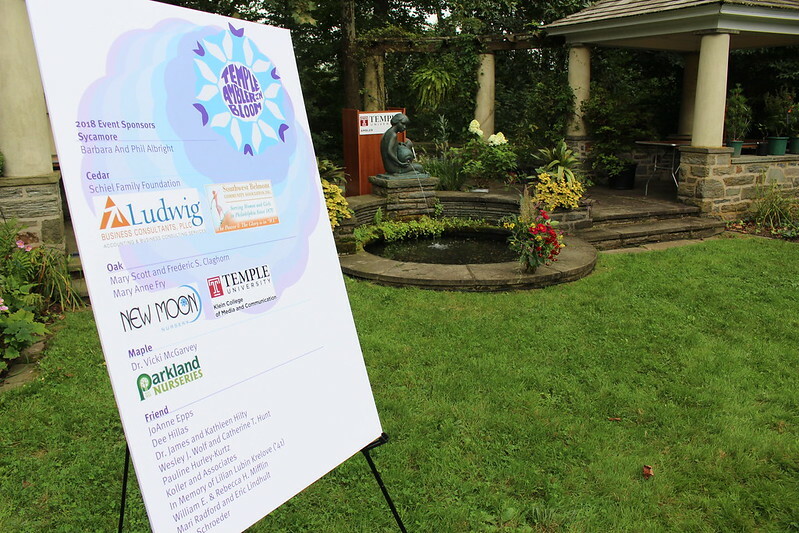 Ludwig Business Consultants, PLLC very generously provided sponsorship for Temple Ambler in Bloom. Every person, every place, is a collection of stories. With well over 100 years of history, the Ambler Arboretum and Temple Ambler have a vast, intricate and diverse story to share. An institution of higher education for women when such opportunities were all but unheard of. An essential campus of Temple University. A living laboratory for students and faculty. A place of diverse habitats and ecosystems. A place for unique hands-on education and research experiences. A place where tens of thousands of students have gone on to careers that positively impact the world around them. And Temple Ambler’s tale is still unfolding! Thanks to the generosity of Temple Ambler in Bloom supporters, sponsors and participants in the popular live and silent auctions, $31,500 was raised for the Ambler Arboretum! Proceeds from Temple Ambler in Bloom 2018 will go to help tell the story of the Ambler Arboretum's past, present and future through educational and directional signage and technology being developed by KieranTimberlake. In addition to celebrating the story of the campus and its gardens, Temple Ambler in Bloom 2018 also honored alumnus Mary Anne Fry (’58) who has been part of Temple Ambler’s history for more than half a century. More than 20 members of her family came to In Bloom to share the moment with her! This is an exciting time for Temple Ambler and the Ambler Arboretum, according to Dr. Vicki Lewis McGarvey, Vice Provost for University College and Executive Director of Temple University Ambler. Earlier this year, Temple’s Board of Trustees and President Richard Englert directed Provost JoAnne Epps to examine a variety of potential research partnerships and other types of coordinated efforts with departments within the University and outside organizations that would be of great benefit to students, faculty and Temple alumni in addition to the community as a whole, McGarvey said. The Temple Ambler In Bloom Committee for 2018 was Phil Albright, Wendy Brister, Mary Claghorn, Josh Meyer, Kelli Mulligan, Kim Pennente, and Mari Radford. Numerous in-kind donations were also made to Temple Ambler in Bloom by the following organizations: The Academy of Natural Sciences, Act II Playhouse, Ambler Area YMCA, Ambler Flowers, Awbury Arboretum, Bowman’s Hill Wildflower Preserve, Bridget’s Steakhouse, Broad Axe Tavern, Buttonwood Blooms, Cantina Feliz, Chanticleer, Stephanie Cohen, Colibraro’s Nursery, Deck’s Hardware, From the Boot, George’s Market at Dreshertown, Giant Grocery Store, Great Barn Brewery, Harmony Hill Nursery, Liacouras Center, Longwood Gardens, Morris Arboretum, Philadelphia Society of Botanical Illustrators, Pinelands Nursery, Polites Florist, Primex Garden Center, SiteOne, Strasburg Railroad Company, Tyler Arboretum and Wyck. The mission of the Ambler Arboretum is to serve as a living, learning laboratory that promotes love and knowledge of horticulture, understanding of the relationship between people and the environment, and an awareness of both the need for and means to achieve greater environmental responsibility. For more information about the Ambler Arboretum, visit ambler.temple.edu/arboretum. For more information on how to support the Arboretum and Ambler Campus, contact Angela Davis at angela.davis@temple.edu or 267-530-2933. To share your Temple Ambler stories, contact Kathy Salisbury at kathleen.salisbury@temple.edu or 267-468-8400.